Hello again my dear treasured friend. It is enlightening and confusing at the same time when one travels and lives in different continents for some time. Sometimes I dream that everyone I ever knew lived in the same neighborbood. That would be utopia. Here’s a song called “different eyes” – about how we see things in a different light as we age, travel, change and grow. performed at the Venue, last year, hosted by my old but not so old dear friend and guitarist extravaganza, Az Samad. This year, we will be performing as a feature again at Bee Publika, hosted by Reza Salleh. February 25. Put that down on your calendar and please join me for some mamak after. Yippee! Back in the studio – with Seth and ..
Rehearsal and Recording with Seth and our dog, Stanley. Yesterday I had the pleasure of playing with two of my favorite improvisers – Jie Ma (pipa) and Daniel Berkman (Kora, uke, looper, multitude of instruments). 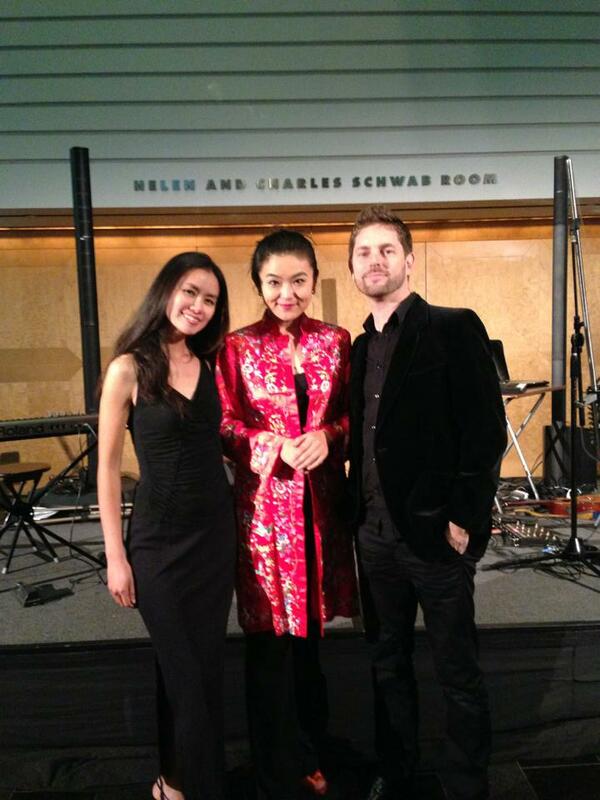 We played two completely improvised sets at the San Francisco Museum of Modern Art. There is complete freshness and magic to creating music on the spot. It is improvised art at its most enjoyable state. Improvisation works best when you can leave your ego behind. It works best when you can listen to your band mates and play what is needed to make everything whole. It works best when you can speak freely and not have to prove anything. Just create. Have fun. Make something beautiful out of thin air. 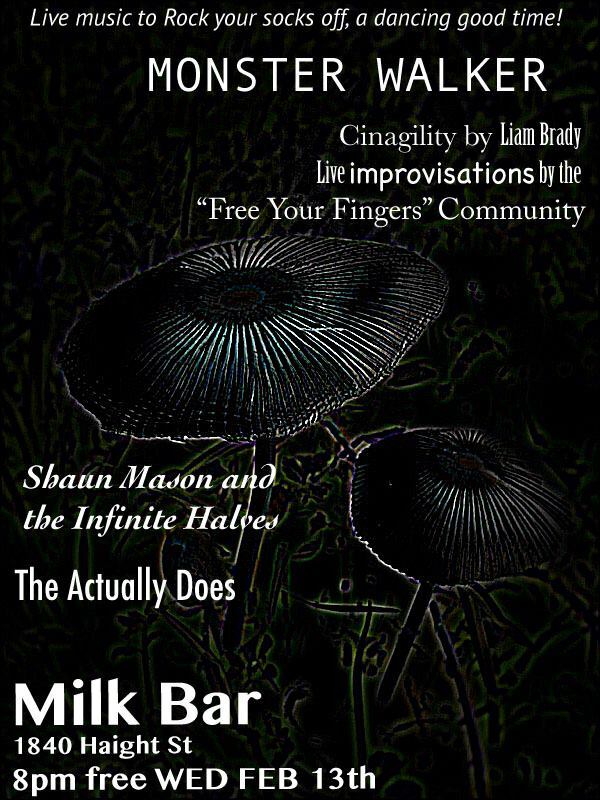 And on Feb 13, 8pm, I will be playing with the “Free your Fingers” improvising community at the Milk Bar. Come on down for some improvised hip-hop, electronica, rock, funk, crazy jamming fun. 8pm, at the Milk Bar, Haight St, San Francisco. But you don’t have to be a musician to improvise. Everyday we deal with different curve balls thrown at us. Everyday we have opportunities to contribute to our society based on other people’s needs and contributions. Everyday we can create art in our own way. Life itself is a tapestry to be filled with your own touch to it. Improvise everyday. And improvise freely and leave that ego behind. When you play something or do something you really love, are you in the moment? To me that is everything these days. There is of course, a time for rehearsing, fine-tuning and making alterations beforehand. But when it is time to play, really play, I try my best to let go and be present in order to let the music ring true. And when I do.. time slows down to a surreal movie-like pace. There is peace in the moment. There is a chance for honesty. After many years of playing, I’ve realized what I enjoy most when I watch someone play is not the fancy notes, the fancy chords, the acrobatic finesse, but what the music does to me emotionally. Also, like enjoying a movie – are you struck by the beautiful costumes, the dramatic cinematography, the big star actors, or are you so swept up in the moment that you forget you are watching a movie. You can feel your heartbeat, feel a tear rolling down your cheek, trying to control it from falling, you can feel the ache in your stomach as you laugh so hard till you cry. Here I am again – I will do by best to update new music and thoughts here. This will be fun. I haven’t blogged for ages.